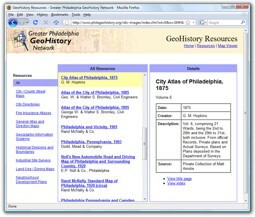 The purpose of the Greater Philadelphia GeoHistory Network is to gather geographic materials useful for the study of historic Philadelphia and its region. This site contains thousands of old maps, property atlases, city directories, industrial site surveys, and other items documenting the history and development of the city from the 1600s through today. This site is compatible with current versions of all major browsers: Internet Explorer 7+, Firefox 3+, Safari 4, Chrome. New! You can now use our interactive maps from your iPhone or Android device! Browse through all of the resources available on the GeoHistory website, as well as related resources available on the web. 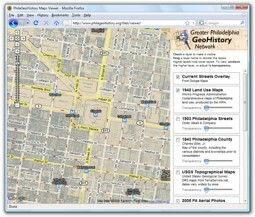 View high-resolution digital images of historic maps and documents. View mosaics of selected historic maps, mixed with current maps and aerial photographs from Google in an interactive viewer.